Greetings from my garden where I just picked and ate my first tomato of the season. I decided this event was a good reason to post for Dear Friend and Gardener, Dee's virtual garden club for those of us who grow our own vegetables. I also decided the first tomato of the season was a good reason to recreate one of my classic tomato pictures, which I posted way back in 2008 in a post titled "Ritual of the First Tomato". I enjoyed writing that particular post, making fun of myself and other gardeners for the big fuss we make when we harvest our first tomato of the season. So here's my "big fuss" picture of my first tomato this year. It is a Beefsteak variety, I think. I'll have to double check the tags tomorrow. It isn't, or shall I say, wasn't, very big. I already ate it. It was six nice bites and of course I let some of the juice drip down my chin and onto my shirt. That's the proper way to show you really love a tomato. Do you know what else is special about this tomato? 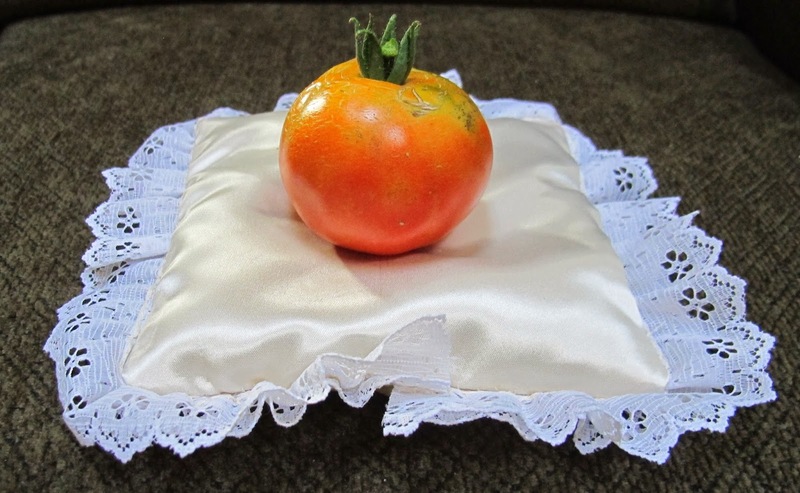 No, not that it looks good on a satin and lace pillow, though it does look good on a satin and lace pillow, doesn't it? What's special about this tomato is it is the earliest ripe tomato I've ever picked from my garden since I started keeping records. I need to check those records to see how much earlier it is, but I would guess it is about two weeks earlier. I'm not sure what I did different to get it to ripen earlier. I bought the same small size plants I always buy and I planted them in mid-May, like I always do. It's a puzzler. I have no other tomatoes close to turning red, so it will be a while before I'm harvesting tomatoes faster than I can eat them. I look forward to those days! Elsewhere in the vegetable garden, the green beans are forming and there isn't a bug on those plants. I should also have squash and cucumbers to start picking soon and my sweet corn is tasseling. We've had quite a bit of rain so far this growing season so the peppers are sulking and look terrible. They would prefer it be a little drier, I think. Oh well, we don't always get the ideal growing conditions for everything. I hope the peppers will start to grow better in the weeks to come. I also hope your gardens are doing well and you are starting to reap the rewards of growing vegetables. P.S. - I am also starting to pick red and golden raspberries, just a few here and there for breakfast. They are delicious! Great! All flowers in your garden is one month after in Bulgaria. Tomatoes are 2 weeks before ours. Did you plant one and the same variety of tomatoes? Some varieties are fast growing. Congrats. I have picked about 7 or 8 grape and roma tomatoes. I picked the first one a couple of weeks ago. This is the earliest harvest for me, ever. There is something magical about that first tomato, whenever it is ready. It should be enjoyed with great ceremony, pomp and circumstance. I've been getting Hawaiian currant tomatoes for about a month now here in North Central Texas, but the big Homestead 24's just really started last week, followed by the Anahu's. The Black from Tula's are taking their time :-) About the time you are picking them faster than you can eat them, we'll be done with tomatoes until fall... just gets too hot to set fruit here. Here in MD (outside Washington DC) we're getting a lot of cucumbers and a few tomatoes. But I can see a lot of green tomatoes of 4 different types on the way. And we've gotten a few zucchini so far. We're had a wet spring, but this week we've had a heat wave with temps in the mid-upper 90's. I got out the sprinkler for the first time on Tuesday evening. I don't have any picture of the harvest on a satin pillow - I have been using a wooden cutting board as my back-drop. Something more manly and utilitarian about getting them on the cutting board for the pictures I guess. And not wasting any time after the photo shoot. Have a good holiday tomorrow. Congrats on your first tomato. We have had our first blackberries. While I wrote this as plural there were only 2 of them. Still they were fun to pick...and eat. Oh, I love first tomatoes of the season! Nothing spells "summer" for me as does the taste of a ripe, juicy tomato! I always eat it right there in the garden. Yummy Carol...my tomatoes were blooming until the deer ate one of the plants...grrr!! But I hope to see a tomato in a few weeks from other plants. I'll be posting to Dee's virtual garden club this week.